Not sure if herbs count at vegetables or fruit but thought this would be the best place to post this. 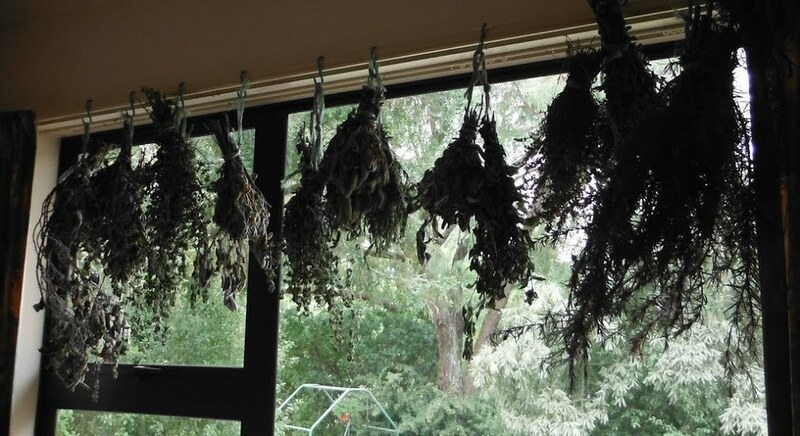 Today we harvested our first selection of herbs and now have bundles of sage, thyme, oregano and savoury hanging up to dry together with the same herbs plus some chives and garlic chives currently being frozen as ice cubes in the freezer. We have elected to freeze these in water rather than virgin olive oil but will try this other method later. After a few experiments last year this a new thing for us and the herb garden is looking good so far even with the constant battle to keep the chickens out, we found one sitting on two eggs in the lemon balm yesterday how long she had been there is anybodies guess!! We have also planted dill, fennel, coriander, lemon/purple/normal basil and rosemary but these are taking longer to grow and mature, we still have spaces for a few more plants/seeds but have yet to decide on which victims we will practice on next!! Not experienced with many herbs, but the rosemary, I just used to snip off what I needed rather than dry any, an all year round, green plant, non-deciduous is it? I do dry a little Rosemary so I've got some for during the winter but on the whole I tend to do as Hedgehugger says and I cut it off as needed then give it a good hair cut so it doesn't get too woody. 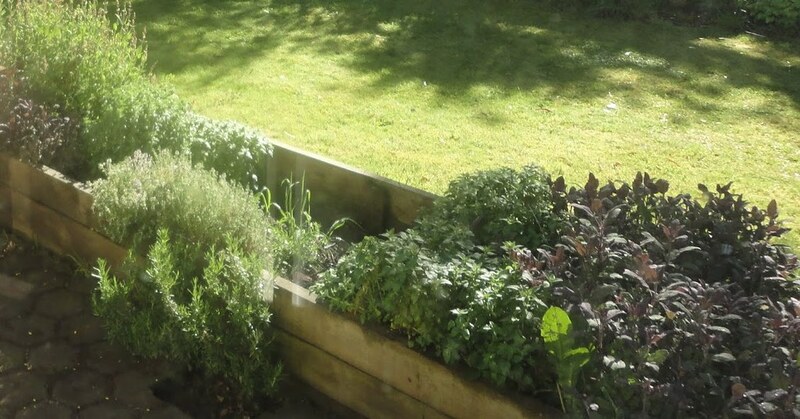 Other herbs we grow in the herb garden are: Chives and garlic chives, Marjoram Tarragon, Parsley (both curly and flat leaf), Oregano, Thyme, Sage (purple and variegated). During the summer I also plant edible flowers in there as well ...so Nasturtiums (so you can also use the seeds they produce and pickle them make poor mans capers), cornflowers and marigolds in a variety of colours because I think they look and taste nice in a salad. 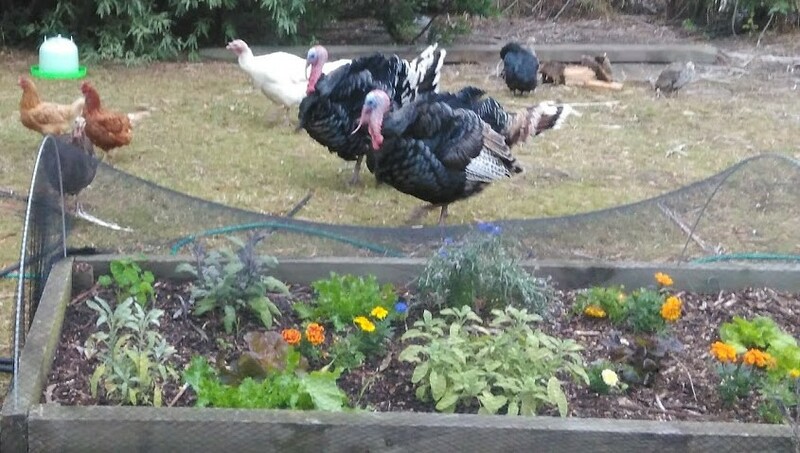 We have put netting over the herbs but to be honest it hasn't done much ....they Turkeys especially (but the bantams as well) just stomp on top so they eat the greens !! The dining room tends to be the place we dry things because it gets a lot of sun and even though in the summer it can be quite hot NZ is still unpredictable so this way they don't have to get moved about a whole heap. 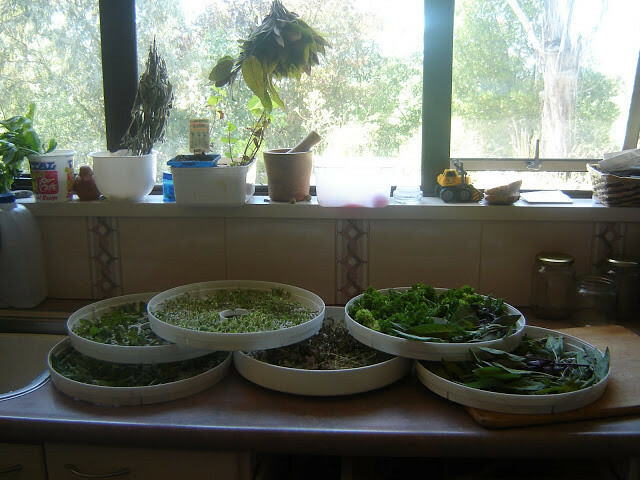 but I also use a dehydrator - especially for the smaller leaf herbs because they are more delicate. I dry some more than others as I said before I don't dry much rosemary to be honest as I find it a bit tough when it's dried. but I'll dry as much as I can of the softer leaf herbs and then I use coffee jars (which colleagues kindly gave me from work) to store things in because they are air tight and they've worked really well (and they were free lol). The herb garden is about 7m long by 1.2m wide and it does give a really good return. 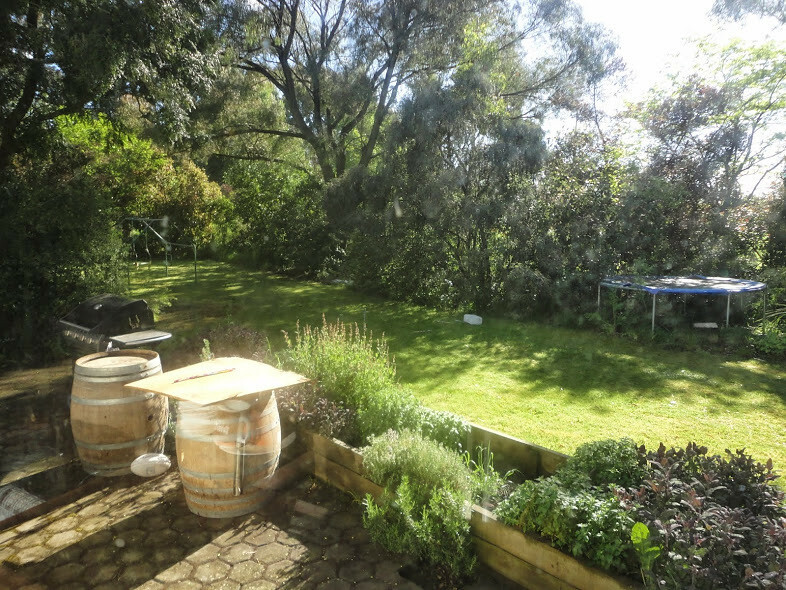 The view from our kitchen window means I can keep an eye on how things are with the garden and it's all handy for the BBQ and the smoker (in the wine barrel). I love the thought of the turkeys 'stuffing' themselves. manda - I am impressed! You really have this herb thing hacked! lancashire lass - thanks for the link, I experimented with the microwave method today and yes.......... I managed to singe/burn the herbs the first few times but it made the kitchen smell nice!! Cut some more today so we should hopefully have a good stock by the end of the growing season. We did have some lovely rosemary bushes but the winter took its toll on them, even with protection wrapped around them they all turned brown and looked dead, we cut them back to a couple of inches tall and they are now beginning to grow back, not sure what we can do differently to protect them this winter. Trev62 wrote: manda - I am impressed! 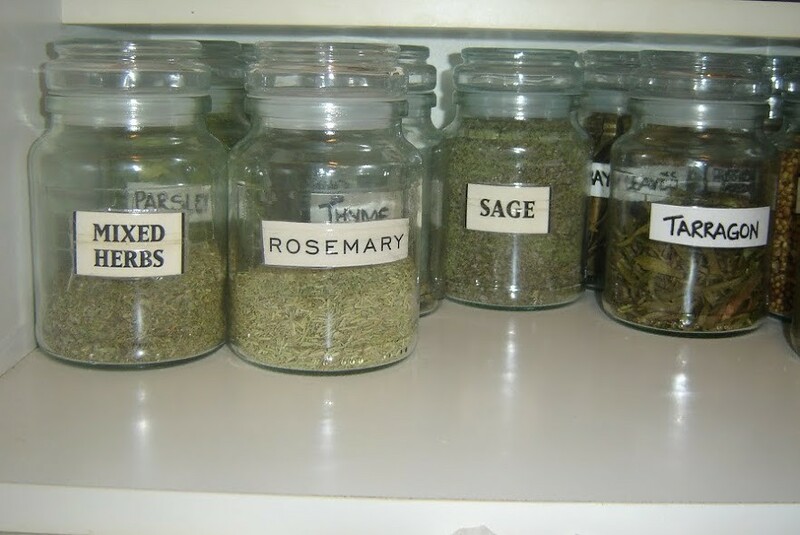 You really have this herb thing hacked! Not sure about that Trev but we're getting there and the nice thing is it's got a point where I buy very few herbs which was the main aim of the garden. Trev62 wrote: We did have some lovely rosemary bushes but the winter took its toll on them, even with protection wrapped around them they all turned brown and looked dead, we cut them back to a couple of inches tall and they are now beginning to grow back, not sure what we can do differently to protect them this winter. Where are they planted Trev? If you are wanting to keep the plants going through the winter they are going to need to be in a sheltered warm spot . Could you get some microclyma cloth ? (sorry don't know what it's called in Europe) ...failing that you've got to wait till the first frost and then prune it back to about 3 inches and bury it in soil / compost and use dried during the winter or freeze so maybe you keep softer leaves (which I have to say I don't have to do as ours seems to be OK where it is through winter - but maybe we have a hardier variety to survive in NZ anyway. If you are wanting to keep the plants going through the winter they are going to need to be in a sheltered warm spot . No manda they where not in a well sheltered spot (my error) and we had an extremely cold winter here which obviously did not suit them, it did not help with us having no idea how to look after them either as our herbs were all an experiment last year. 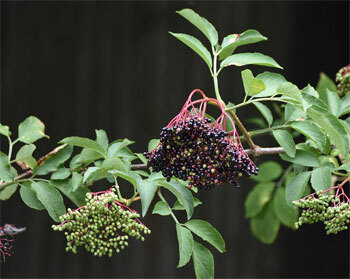 manda wrote: If you are wanting to keep the plants going through the winter they are going to need to be in a sheltered warm spot . Could you get some microclyma cloth ? Thanks for the tip, we have found a cold/frost protection fleece in one of the small garden shops we use here which I presume is similar to microclyma cloth, we use this shop often as the owner uses the internet to try and find the bulgarian equivalent of what we need, it is rather amusing as he practices his English while we practice our Bulgarian and an hour later we might have got somewhere!! Still "microclyma cloth" got him stumped until I said it is like a winter coat for plants! Having looked at your photos again it certainly gives us an incentive to persevere with the herbs and fingers crossed have a bit more success as we progress. Thanks for posting the reply and photos.